Endometriosis awareness month continues to power forward and I think this year has already been a major success – the buzz on Twitter, Facebook and all over the internet is incredible. I think 2013 may turn out to be the best year for endometriosis awareness yet and the only way is up! So without further ado, let’s have a look at a few more selected pieces of endometriosis research that’s been published recently. First up is a review paper examining all the current evidence concerning the link between chronic pelvic pain and bladder pain syndrome (BPS). The term bladder pain syndrome is often used interchangeably with interstitial cystitis (which is different from bacterial cystitis) and is characterised by painful inflammation of the bladder leading to frequent need to urinate and painful urination. The cause of BPS is often difficult to ascertain unknown (or requires trial and error investigation to find out). The above review found that, out of 1016 patients with chronic pelvic pain, 61% had BPS and 70% had endometriosis. Interestingly, in those women with endometriosis, BPS was recorded in 48% of cases. This means that almost half of women with endometriosis may suffer from bladder pain. This raises some interesting questions, perhaps most obviously –what is causing such frequent bladder pain in women with endo? Women with endometriosis are known to suffer from recurrent urinary infections, but this can be distinguished from interstitial cystitis as a urinary tract infection will clear up with antibiotic treatment. Another obvious conclusion could be endometriosis of the bladder is causing BPS. The problem is, endometriosis of the bladder is considered uncommon, occurring in around 1% of patients according to reports. It may be that, because the bladder and places endometriosis is more commonly found are close together, chronic inflammation related to pelvic endometriosis irritates the bladder as well. In order to see whether this were true, it would be useful to conduct a study following women with BPS and endo, who have had their endometriosis surgically removed and see if their BPS abates after surgery. Next up is a study, which you can read in full here, looking at the involvement of macrophages in endometriosis. A good place to start would be asking, what is a macrophage? Macrophages (literally translated meaning ‘big eater’) are one of the many different types of cell that make up your immune system. Macrophages are found in every tissue of the body and their primary job is to ‘consume’ and destroy diseased/cancerous cells or pathogens like bacteria, then send out chemical signals recruiting other immune cells. Normally macrophages should recognise endometriotic cells as abnormal and destroy them however, as this study points out, in women with endometriosis their macrophages are somehow defective and treat endometriosis as a wound rather than diseased tissue. What this means is that macrophages actually promote the survival of endometriotic cells. As the authors of this review point out though, this opens up quite a novel avenue for the treatment of endometriosis i.e. restore the correct function of these macrophages and let your own body destroy the disease without the need for drugs or surgery. Of course how one would go about doing that, I have no idea and I’m not even sure if the ability to do so exists yet. Nevertheless it’s a fascinating prospect to consider. Finally for this post is a study looking at whether there are any differences in the clinical characteristics of adolescent girls with endometriotic ovarian cysts (endometrioma). This study took 376 women who were undergoing surgical treatment for endometrioma and divided them into four groups according to age: Group 1 – under 20 years old, Group 2 – 21-30 years old, Group 3 – 31-40 years old, Group 4 – 41-45 years old. The clinical characteristics of these groups (e.g. menstrual history, symptoms etc) were then compared to see if there were any differences or similarities. The authors speculate that adolescents who develop endometrioma may do so because they have more ‘adult like’ menstrual cycles (i.e. regular in terms of duration and timing). Although the authors point out a comparison with disease-free adolescents is necessary to confirm this. There was no significant difference seen in endometrioma size, position and stage between the four groups. Another interesting finding was that none of the women, in any of the groups, were found to have deep endometriosis. Although it is speculative to say, this does hint that endometrioma and deep endometriosis may have different origins. It is important that studies such as these are being undertaken. Endometriosis in adolescents has, and still is, a grossly under recognised problem. More studies characterising the disease in young girls means greater awareness and earlier intervention. 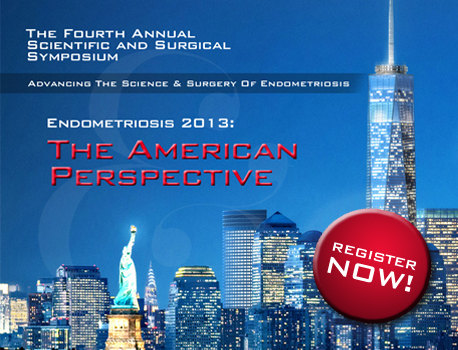 The 4th annual scientific and surgical symposium on endometriosis has been held very recently by the wonderful Endometriosis Foundation of America. This conference brought together expert surgeons, scientists and women with endo from all over America and the world to talk about advances in our understanding of the disease. If you couldn’t be there and missed the live broadcasts, don’t worry! You can watch all the talks and presentations as streaming videos via this link. They’re well worth a watch; I guarantee you’ll learn something you never knew about endo!